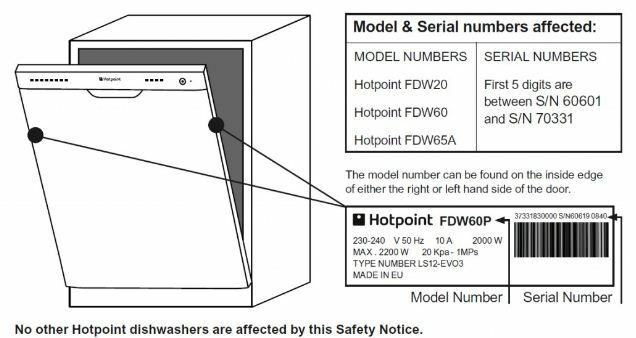 The Isle of Man Office of Fair Trading wishes to make the public aware of an important safety notice which relates to Hotpoint FDW20/FDW60/FDW65A dishwashers manufactured between June 2006 and March 2007 with specific serial numbers. In rare cases the failure of an electrical component could present a potential fire hazard through overheating. Firstly, as a precaution, make sure that your dishwasher is turned off and disconnected from the wall socket. Check the model and serial number of your dishwasher. These can be found on a sticker on the inside of the door as outlined below. The serial number is 9 digits long. If the first five digits are between S/N 60601 and S/N 70331 your dishwasher is affected. If your dishwasher is affected please call Hotpoints dedicated Customer Service line on 08448 910094 or you can email: fdw@hotpoint.co.uk. You can also check online at: www.hotpointservice.co.uk/fdw. Hotpoint will arrange to visit your home and make a free of charge repair.